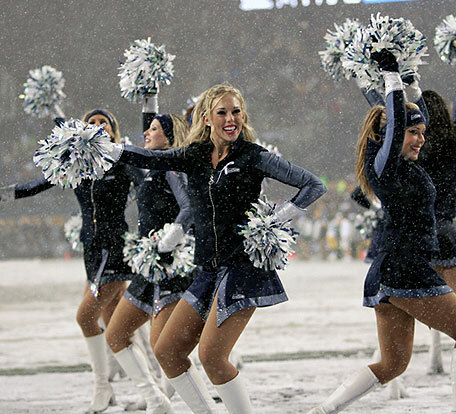 The Sea Gals are the official cheerleading squad for the NFL�s Seattle Seahawks franchise. Their training regimen is noted as being particularly intense, and between 24 and 32 young women are chosen to participate each year. Besides cheering at Seahawks� home games, the Sea Gals also make personal appearances and participate in charity events. During games, the Sea Gals split up into four groups and cheer at each corner of the end zone. Between quarters, the women will gather back together and perform routines with the full squad. The NFL awarded Seattle a pro football franchise in 1976. The Seahawks� first home game took place on September 12th, 1976, and the inaugural 21-woman roster of the Sea Gals was present. The roster size has increased by a few ladies, and the uniforms have underwent a number of changes. Otherwise, the Sea Gals have continued uninterrupted since their inception in 1976. Squad auditions are held yearly, and participants must be at least 18 years of age and have a high school diploma. The audition process is broken up into four stages, with the number of applicants being reduced at each stage. All auditions are closed to the public. If selected, a Sea Gal is expected to attend all rehearsals. If a girl misses a rehearsal, she will not be allowed to cheer during the next home game. Missing three practices without an excuse will result in dismissal from the squad. For all hours worked, the Seattle Sea Gals are paid an hourly wage (including overtime). They also receive two free tickets to each home game. This yearly program is open to girls from seven to fourteen years of age. Participants learn teamwork, self esteem, physical fitness, dancing and cheering. Girls attend three clinics, and the routines learned during these practices will later be performed during a Seahawks� preseason game. Sea Gals are available year round to make public appearances. The only exception is during squad tryouts, which usually occur in April or May, and on game days. Appearance fees are $150 per hour, per Sea Gal, with a 2-hour minimum. The Sea Gals Show Group is also available, and they perform a 60-minute show filled with singing, dancing and a number of colorful costume and scenery changes. Themes range from Disney to the 50s, and routines are appropriate for all age groups. A Show Group performance costs $2,000.